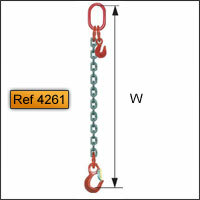 Manufacturing, calculation methods, testing and certification of sling chains is now subject to a harmonized European standard (EN 818-4) which is in support of the essential requirements of the Machinery Directive 2006/42/CE (Amendment 98/37/CE). 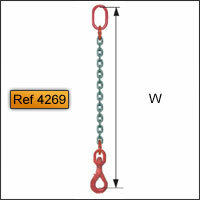 The maximum loads of usage presented (between 0 and 90°) are given for general lifting applications. Ref 4263 codes X to F : 1 ring + 1 hook - V.A. 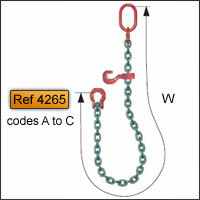 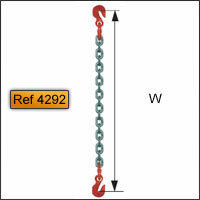 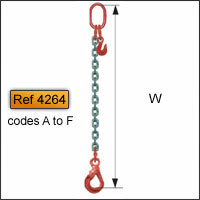 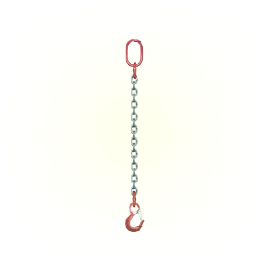 Ref 4264 codes A to F : adjustable to 1 ring + 1 hook - V.A. In your request for quote please specify the Ref. Number of the type of sling you desire from the pictures above.